Veterinarian Party 7yr old My daughter loves animals and wants to be a veterinarian when she grows up so I threw her a vet party! In the invitations, which we made on the computer, we asked that each girl bring her favorite pet (stuffed of course!). When the girls arrived we gave them name tags that said Dr. ____with their name. I greeted everyone in a lab coat. They all received a medical chart, which was a folder with a printed list of questions and medical information. It had places to fill out the pet's name, size, age, weight, color etc. Also had areas to mark that they had been vaccinated. A checklist of items for the vets to check. We had three stations set up that were manned by grandparents that the girls moved through to fill in their charts. A weight/measure station, a vaccination station and a table with all kinds of doctor kit items (play and real). I also had gauze to bandage any broken legs. We helped each girl play vet and fix up her animals. I had gone to my local vets office and they were glad to give me bags (like you get your prescriptions in and this served as our goodybag), empty pill bottles, syringes etc. I bought several cheap doctors kits and used what we had. 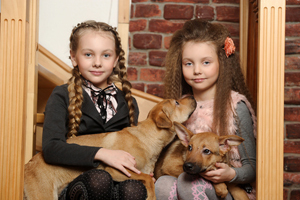 I directed the girls to check the ears and nose the tail and comb the fur of their animals. They loved this and really got into going through the chart, filling in the blanks and playing vet. Then we played a couple games like pass the puppy (hot potato), pin the tail on the kitten and bandage the dog, the girls got a partner and the one was the dog and one was the puppy, the game was a race to see what team could Bandage their dog up fastest (with a roll of toilet paper). We had a craft activity too. We made collars for their animals. I had several types and colors of ribbon to choose from and I had little tags they could write their pet's name on, jewel and foam stickers they could stick on. I had adhesive Velcro pieces that fastened the collars. We had cake, which I had decorated with her Littlest Pet Shop animals. We had Scooby Doo cookies in dog bone shapes and I served these in a dog bowl. The girls all talked about the special pet they brought telling where and when they got it. When everyone was almost done eating cake I called my phone from my cell phone to make the phone ring- then I answered it and acted dramatically like I was talking to someone saying oh no yes well I will ask them. I held my hand over the phone and said girls this is my friend at the pound and the baby animals have been stolen will you help him find them. They were very excited and I explained that there were clues to where they could find the baby animals. They went on a treasure hunt that had clues hidden around the house they took turn reading the clues. Some of the clues were things they had to do like beg like a puppy to her grandpa for a clue, pop a balloon to find a paper inside. The treasure was a basket full of beanie baby cats and dogs that they each got to choose one of. The girls then wanted to play vet at the stations some more so I did not even play all the games I had ready. It was a unique and fun party! My daughter loved it.